Members of the Jewish National Fund-USA’s executive management team, along with JNF partners and local leadership of the Eshkol region, plant trees in the wake of the recent destruction of agricultural lands in the Halutza communities. Credit: Jewish National Fund-USA. Quite literally among the booms and billows of black smoke across the nearby Gaza border, deep in Israel’s southern Negev Desert, the new community of Shlomit laid a cornerstone and broke ground for their future community center. The new structure will serve not only Shlomit, but the entire Eshkol region in southern Israel. A mere 700 meters from Israel’s border with Egypt and just a few kilometers from Gaza, Shlomit and the other budding communities of Halutza are defying the odds and showing that they, and the people of Israel, are here to stay. “Eleven years ago, we stood on a hill in this area looking out at nothing but sand, and a man with a bit of meshugana said that he will build three communities here. This is the outcome,” said Robinson as he gestured to the attractive new houses dotting a horizon that abut parks, playgrounds, scores of greenhouses and the plot of land where the new community center will be.In the presence of distinguished guests, including Yarkoni, Knesset member Nurit Koren, the World Zionist Organization’s Settlement Division regional director Itzik Bar, JNF CEO Russell F. Robinson, JNF Chief Israel Officer Eric Michaelson and Ron Werner, a member of JNF’s national board of directors, members of the Shlomit community planted trees in their soon-to-be first permanent neighborhood. The occasion was made even more joyous with children singing “Hallelujah” in sign language, and guest speakers recounting the inspiring story of a new community that was sand dunes and dust a mere decade ago. JNF’s partner Halutza is a group of three communities, headed by that “meshugana man,” Rabbi Eli Adler. It’s made up primarily of former Gush Katif residents who were evacuated from their homes during Israel’s 2005 disengagement from Gaza. Given a choice to move elsewhere, families rebuilt their lives in this area of the desert that had never been inhabited or farmed. After a little more than 10 years of hard work, Shlomit is taking shape and driving change in the region, showing that growth and development are possible in even the most remote areas of the Negev. 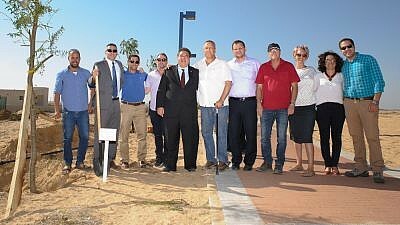 The groundbreaking of the Shlomit community center is important—not just as a sign of endurance in an embattled region of Israel, but as a critical source of services for the entire Eshkol region, as it will include classrooms and communal spaces, and provide learning opportunities, extracurricular activities and community events for all of the region’s residents. The event, at this particular time in Israel’s history, made a poignant statement, according to those involved—one that echoes throughout the region as terrorists continue to try to literally “burn out” Israelis from their border towns. Next articleQueen of Deals: The Cedarhurst Sidewalk Sale! How Many Final Four Coaches Have Coached Maccabiah?